In the 40 years since SCAS was founded, SCAS members and like-minded colleagues across the globe have identified much of great relevance about human-animal interactions (HAI). Significant contributions to our better understanding of HAI by SCAS members will be discussed, including key work undertaken by SCAS founder members. The wide range of programmes and the remarkable work undertaken by SCAS and its members will be described. SCAS members, through their understanding of the human-animal bond and how to harness this, are helping a very wide range of clients with special needs in diverse settings. Together we have improved quality of life, whilst also raising standards in animal welfare. We are all undertaking a journey in which, through raising awareness of the benefits accruing from animal companionship, we are now witnessing a paradigm shift in attitudes to companion animals and their role in society. In the early days, i.e. the early 80’s, it was difficult to get permission for any animal to enter a care facility, and especially into a hospital. However, there is now general awareness that health and social benefits accrue from the presence of animals. And most health care facilities now have a much more positive view. Unfortunately, an area of our work that has not developed apace concerns pets in housing. Many people in the UK who would benefit from having an companion animal are denied the opportunity by the existence of pets in housing bans. However, there is now growing interest and support from politicians and we take encouragement from other countries which have successfully introduced positive pets in housing policies. Elizabeth became attuned to the significance of companion animals in the lives of vulnerable people whilst working in an inner city veterinary clinic in Glasgow. Over a period of 40 years she and her husband pioneered bond-centred veterinary practice, supporting and encouraging healthy human- companion animal bonds. Outreach programmes delivering Animal Assisted Intervention (AAI) programmes were delivered to schools, nursing homes, hospitals, sheltered housing, psychiatric hospitals and prisons. Elizabeth has travelled widely to visit model AAI programmes, as a Churchill Fellow, and subsequent study trips to N America and Asia. 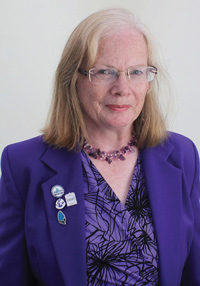 Elizabeth is Chairman of SCAS; Vice President of The International Association of Human-animal Interaction Organisations (IAHAIO); Trustee of Our Special Friends; co-founder and Vice President of Canine Partners, the UK assistance dog programme; and visiting lecturer to veterinary schools. She was awarded the Inaugural International William McCulloch Award for excellence in human-animal interaction education and practice.